The 600FD Series HydraFlex Draper Platform features HydraFlex, an industry-exclusive hydraulic float system allowing for superior ground following capabilities over a wide range of crops and conditions. From the cab, the operator can simply adjust the armrest encoder knob which varies the hydraulic pressure in the float arm hydraulic cylinders. This controls the cutterbar ground pressure depending upon conditions. With the HydraFlex float system, the operator varies the cutterbar ground pressure but does not affect the cutting height of the crop, even at high ground speeds. 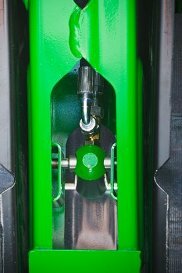 The hydraulic float system features a 19-cm (7.5-in.) float range, allowing for optimum float pressure. To lock out the HydraFlex draper into rigid mode, the operator increases the float pressure to maximum. 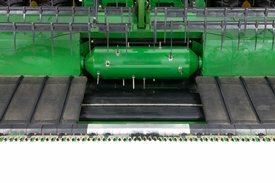 Dual knife drive is standard on 600FD HydraFlex™ Draper Platform for harvesting rice, tough crop, and wet or green crop conditions. 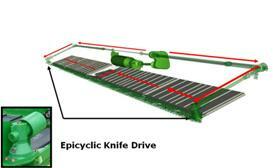 This unique dual knife drive system is timed, creating the smoothest possible reciprocating knife drive system currently in the industry. Positive, reliable, power take-off (PTO) shaft and driven, dual epicyclical in-line knife drives with built-in driveline protection provides producers with the strongest knife drive system in the industry. NOTE: Single-knife drive is available on the 630FD, but increased cutterbar vibration may occur. The 41-cm (16-in.) feed drum improves the crop handoff from the draper belts, resulting in increased material handling and productivity of the 600FD HydraFlex™ Draper Platform. 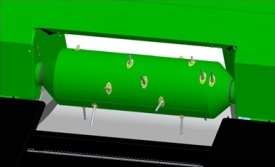 A feature for 600FD Draper Platforms is a feed drum retractable auger finger to improve crop feeding at the corners of the feed drum. 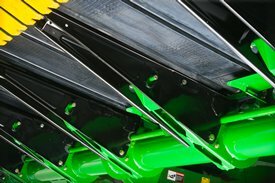 In some crop conditions, the crop can hesitate at the corners of the feed drum, and the retractable drum fingers keep the crop moving into the combine. This results in smoother feeding and better performance of the combine. The speed of the side draper belts can be controlled by an adjustment on the CommandARM™ controls from within the cab. Combine software gives operators the option to slow down the side belts to a fixed speed with a push of a button on the CommandARM. Additionally, a draper belt protection system is integrated into the 600FD HydraFlex™ Draper Platform family to minimize side belt damage should slippage occur. 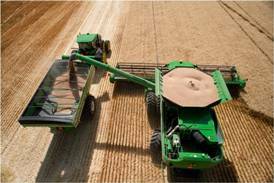 John Deere Machine Sync adds unprecedented automation to combine harvesting. This automation, coupled with harvesting logistics information, has revolutionized the harvesting experience. The adoption of on-the-go unloading during harvest continues to increase as combines spend more time with the unloading auger on while harvesting record-setting yields. By offering a new level of automation, John Deere Machine Sync minimizes operator stress and maximizes the benefits of on-the-go unloading. John Deere Machine Sync facilitates on-the-go unloading by synchronizing tractor speed and direction of travel with the combine. This provides greater ease of operation with improved efficiency, resulting in higher productivity during harvest. Productivity gains are credited to tractor/grain cart operator’s ability to be in the right place at the right time with in-field logistics information. The automation and logistics information provided by Machine Sync is made possible with the John Deere Machine Communication Radio. 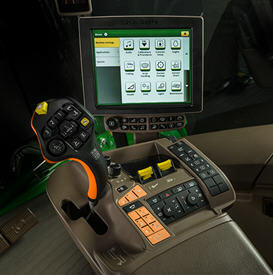 The John Deere Machine Communication Radio creates a network between the fleet of tractors and combines, allowing automation between the combine and tractor. The network can be any combination of tractors and combines up to 10 machines. The GreenStar™ 3 2630 Display shows in field logistics including grain tank fill status, direction of travel, and location for each combine and tractor in the networked fleet.